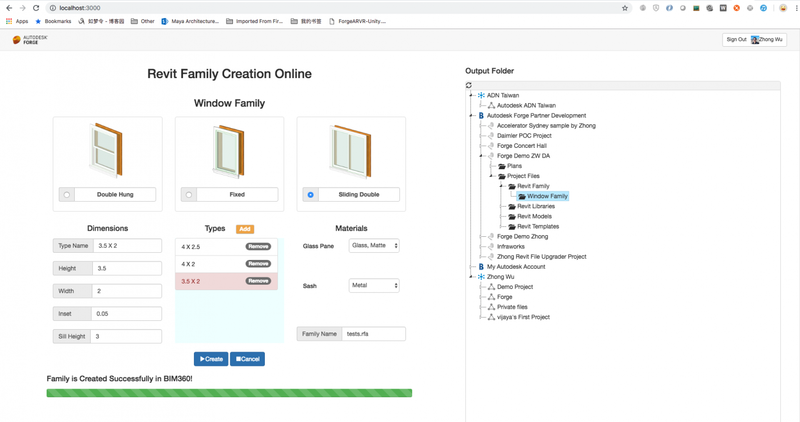 Creating/Editing Revit family is something we usually do with Revit product, but, with the new released public beta Design Automation for Revit API, we now have the ability to create/edit Revit family Anytime, Anywhere, without any installation. This sample is self-explanation, you just need to select different window style, add a couple of family types, specify family file name and output folder, then click Create button and everything will be done on the cloud side with Design Automation for Revit API. 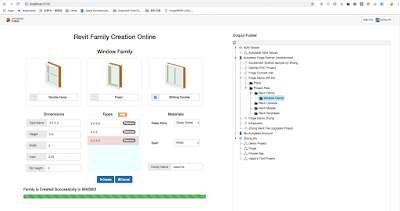 The sample actually demonstrated how to create Revit window family online using Design Automation for Revit API, showing the potential power of this new API, anytime, anywhere, without any installation. Create Revit Addin that can be used in Design Automation for Revit, this requires Revit plugin development skills, and actually, I just migrated from the existing Revit WindowWizard plugin, which you can find under Revit SDK installation. Create your App, upload the AppBundle, define your Activity and test the workitem with Postman collection. This is actually about Design Automation for Revit API, please check this out more at here. Create the Web App to call the workitem with your inputs, remember all the input/output should be a cloud storage url, and that part requires Web development skills. Check the source code on Github/Autodesk-Forge.